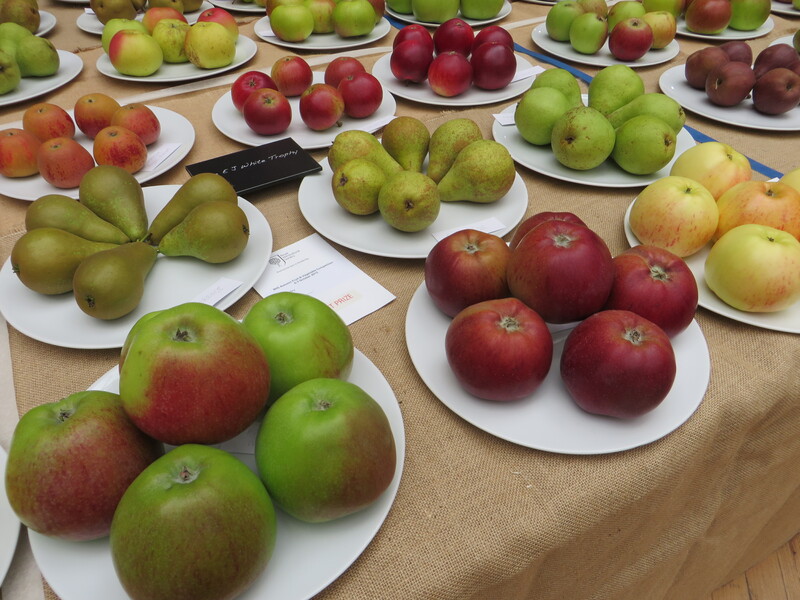 Class 11: ‘Best Collection of Fruit’ at the RHS Autumn Show 2015 won by Adrian Baggaley. Front row, left to right: Howgate Wonder, Mère de Ménage, Reverend W Wilks. Middle row left to right: Conference, Concorde, Pitmaston Duchess. Back row, left to right: Norfolk Royal Russset, Fiesta, Red Devil. The dish of Fiesta in this collection also won the E. J. White Trophy for the best single dish of fruit in the show. For a number of years we have reported the amazing successes achieved by Adrian Baggaley at the Royal Horticultural Society fruit shows. This year he has excelled and even beaten his own records. He entered 40 classes and won 35 of them at the RHS Autumn Show on 6-7 October 2015. 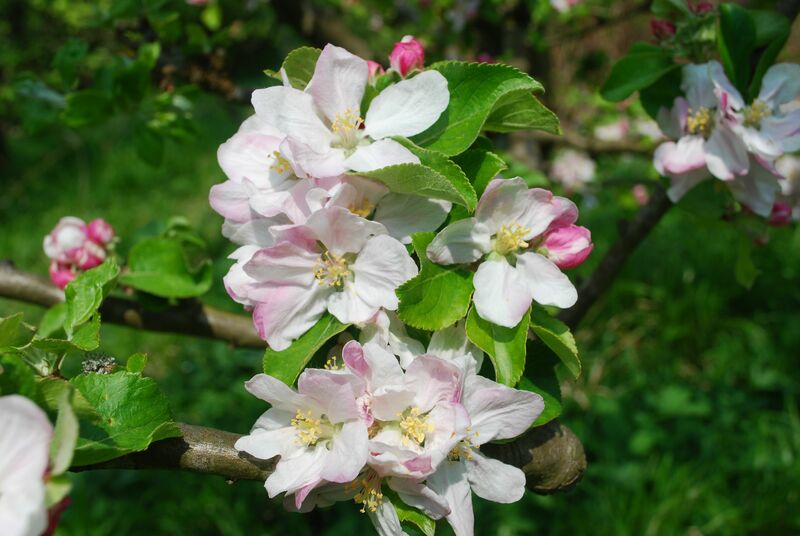 These included ‘Firsts’ for the ‘Best Dish of Apples’, the Best Dish of Pears’ and the most challenging of all the ‘Best Collection of Fruit’, that is, nine perfectly matched and flawless dishes of apples and pears! To achieve this level of success, you need to be very dedicated – take a look at Adrian’s article ‘Growing for Showing‘ on our main website. Well done Adrian! I have a plague of codling moths on a biblical scale. Does anyone else have the same problem? 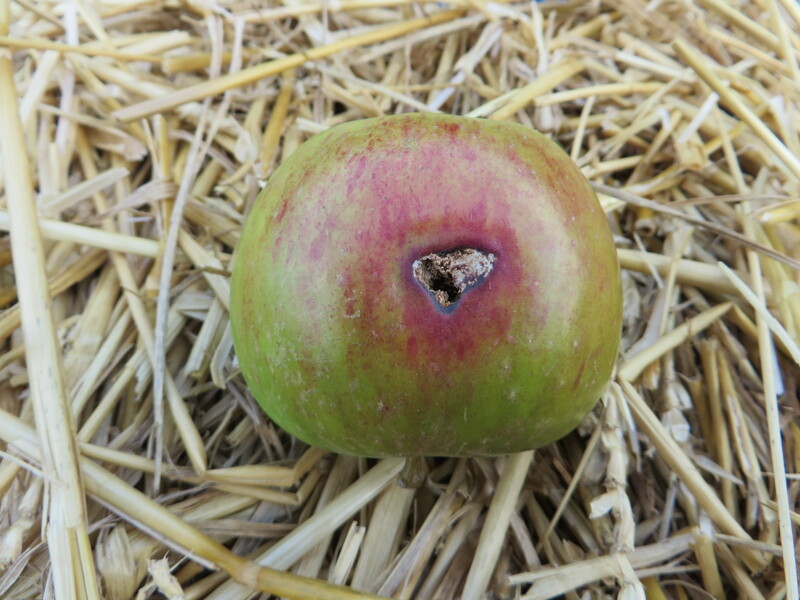 I think the reason is that in my orchard I did not put out the pheromone traps until early July – a month or more later than usual – and this coupled with the early season has meant they were ineffective. Although in a normal year there may be only two or three male moths in each trap all season. So where have all these moths come from, bearing in mind that there was little damage last year. During this summer the prevailing winds have been in the south east or east south east, this is very unusual; the prevailing winds are normally in the south west. My theory is they have come over from the continent on the prevailing winds. The espalier apples have come off the worst, the fruit being more exposed, in particular Mère de Ménage and A. W. Barnes. Over half the crop has been lost already and there are still more to drop off. The season is a strange one, which has affected the pears as well. Yet it was pretty similar to last year, in that little happened before July, a blistering July then again little happened. I noted last year that Conference and Concorde stopped growing in very early September, while normally they would keep on growing to about the end of September, especially last year as the season was very late. This year Beth, Clapp’s Favorite and Marguerite Marillat stopped growing at the very beginning of August despite watering, in fact the watering was a waste of money. 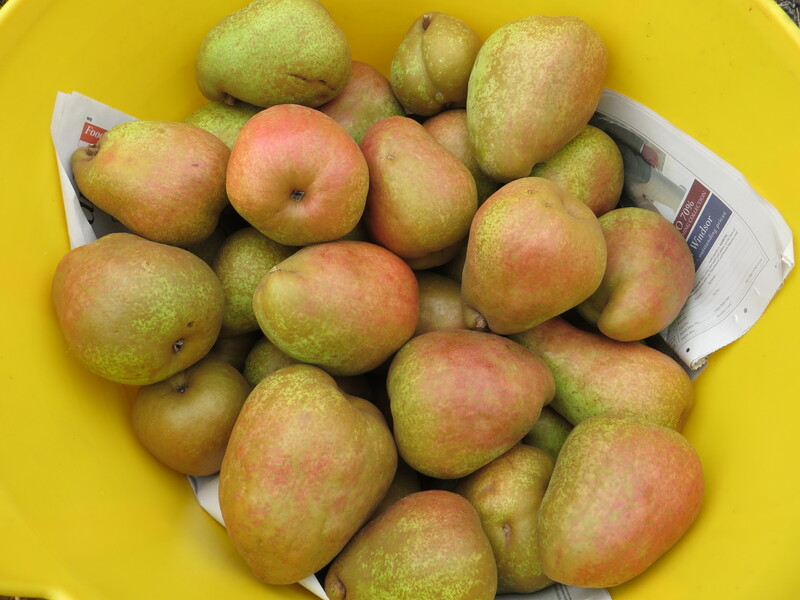 Beth just sat there for a month getting nice and golden and the Clapps’ got more colorful – were they responding to just one real month of pear growing weather. July 2013 and July 2014 were only good for the sun worshippers in my opinion and very little help to gardeners.